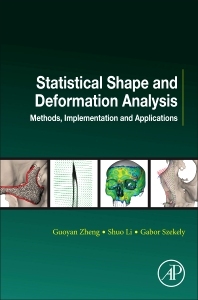 Statistical Shape and Deformation Analysis: Methods, Implementation and Applications contributes enormously to solving different problems in patient care and physical anthropology, ranging from improved automatic registration and segmentation in medical image computing to the study of genetics, evolution and comparative form in physical anthropology and biology. This book gives a clear description of the concepts, methods, algorithms and techniques developed over the last three decades that is followed by examples of their implementation using open source software. Applications of statistical shape and deformation analysis are given for a wide variety of fields, including biometry, anthropology, medical image analysis and clinical practice. Prof. Zheng is the Head of the Information Processing in Medical Imaging Group, the Institute for Surgical Technology and Biomechanics, University of Bern. In 2010, he did his habilitation was awarded the title ‘Privatdozent’ from the same university. His research interests include medical image computing, machine learning, computer assisted interventions, medical robotics, and multi-modality image analysis. He has published over 160 peer-reviewed journal and conference papers and was granted 6 US and European patents. He has won over ten national and international awards/prizes including the best basic science paper published in the Journal of Laryngology and Otology in year 2011, the 2009 Ypsomed Innovation Prize, and the best technical paper award in the 2006 annual conference of the International Society of Computer Assisted Orthopaedic Surgery. He is on the program committee of the 16th, the 18th and the 19th International Conference on Medical Image Computing and Computer Assisted Interventions (MICCAI 2013, 2015 and 2016). He is the general chair of the 7th International Workshop on Medical Imaging and Augmented Reality (MIAR 2016). Dr. Li is the Director of Digital Imaging Group (DIG) of London, an associate professor in the department of medical imaging and medical biophysics at the University of Western Ontario and a scientist at the Lawson Health Research Institute. Before this position, he was a research scientist and project manager in general electric (GE) healthcare for 9 years. He funds and directs the DIG (http://digitalimaginggroup.ca/) since 2006, which is a highly dynamic and multiple disciplinary group. He received his Ph.D. degree in computer science from Concordia University 2006, where his Ph.D. thesis won the doctoral prize giving to the most deserving graduating student in the faculty of engineering and computer science. He has published over 100 publications; He is the recipient of several GE internal awards, and he serves as guest editor and associate editor in several prestigious journals in the field. Dr. Li also serves as a program committee member in highly influential conferences; and he is the editor of six books. His current interest is development intelligent analytic tools to help physicians and hospital administrative to handle the big medical data, centered with medical images. Prof. Székely graduated from the Technical University of Budapest in chemical engineering in 1974 and from the Eötvös Loránd University of Budapest in Applied Mathematics in 1981. He obtained his Ph.D. in analytical chemistry in 1985 from the Technical University of Budapest. Between 1974 and 1986 he has been working at the Computer Department of the Institute of Isotopes of the Hungarian Academy of Sciences, since 1985 as the Head of the Department, focusing on automatic structure elucidation of organic compounds. Between 1986 and 1990 he developed computer support systems for the chemical and biomedical applications of magnetic resonance at Bruker Spectrospin. In 1991 he joined the Computer Vision Laboratory of the ETH Zurich as a senior researcher. In 2002 he was elected as Associate Professor at the Department of Information Technology and Electrical Engineering and founded the Medical Image Analysis and Visualization research group. He has been promoted to Full Professor in 2008. Between 2001 and 2013 he has been the Director of the Swiss National Center for Competence in Research on Computer Aided and Image Guided Medical Interventions. In 2007 he co-founded the spinoff company Virtamed, producing virtual reality based system for surgical training. His major research interest is developing algorithms and clinical systems for the optimal computer support of medical diagnosis, therapy, training and education.